This is a user interface consisting of a 16x2 lcd display and a 16 way touch keypad. Ideal for connecting to a host to use as a front panel. It has an I2C interface and so only two wires are required from the host. The keypad is also buffered so that the host does not need to constantly monitor the keys. void lcd_contrast(uint8_t m); The contrast is a value between 0 and 63 and will require changing depending on the voltage used. The default value is held in EEPROM and is set to about 45 which is right for 3.3V. 5V requires about 25. Start off with 3.3V as the contrast is set for 3.3V (see FAQ). Look at the code simple.py for how it works and in the library for the list of commands. bv4242_lcd <i2cAddress> <row> <column> "text"
./bv4242 0x3d 2 1 "Hello"
The tuning utility is also run from the command line and will show the average values for each channel along with the delta values. When a key is touched the delta values will change for the channel that is being effected. Actual output - finger placed on one of the keys shows the delta value changing from 0. The amount of change is determined by the physical environment. More tuning details can be found in the data sheet. There is a C library very similar to the Arduino library and so will not be repeated here. It relies on WiriingPiI2C and so that will need installing. Once installed the supplied files can be compiled if required. To see how to use the library follow the bv4242_lcd or bv4242_tune examples. The ByPic driver and test program are on the ByPic website. The layouts file contains an svg file. This can be opened and edited in inkscape which is free and rather good. The file contains some rough sketches and also two layouts that have been exported to the png files. Also in the zip file is a dxf file that is an accurate rendering for use in other programs. 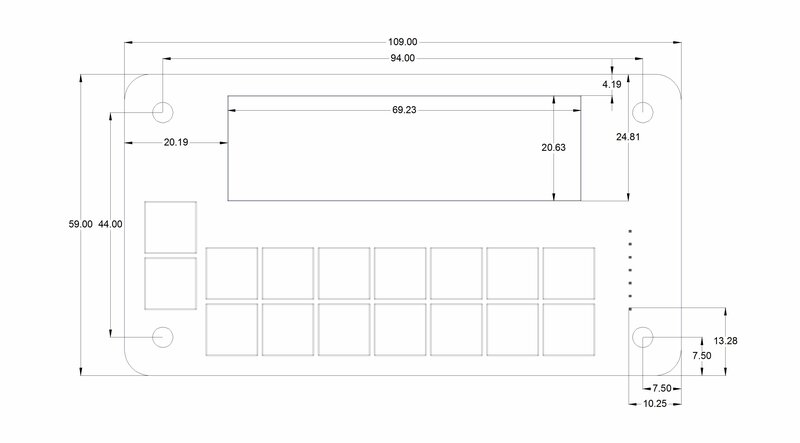 There is also the dimension, dxf drawing in the overlay and samples zip file above. From the back of the PCB to the back of the display is 6mm, the connecting pins protrude for 10mm. This is because the contrast is set in the EEPROM for 3.3V, it will need adjusting via the I2C interface. The contrast needs to be set to about 16 for 5V operation. To keep the power requirements to a minimum each letter takes about 5mS, this does not effect the display but is does effect how fast the I2C can read and write. When writing allow a delay 0f 5mS between each character.